Edgar Schein has been a giant in the field of OD for decades. Instead of writing a separate summary of his last three books, I decided to combine them into one summary. These books offer excellent examples of real organizational issues. In his last book, he adds Lessons Learned, which are really beneficial to reflect on for anyone whose aim is to increase organizational effectiveness. I believe you will see several connections from the father of Organizational Development. 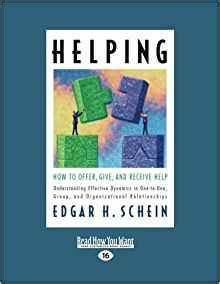 As Peter Block (2011) said in a recent book, we all owe a debt of gratitude from Edgar Schein and his work in helping organizations be better. NOTE: I am reading his current book, Humble Leadership and will post it in a month or so. Schein, Edgar. (2009). Helping. San Francisco: Berrett-Koehler. Helping is a basic relationship that moves things forward. Help is only help if it is seen as help. We all know from experience that for help to be given, AND accepted, ‘Trust is a must” between the helper and the receiver. We all need help because, most of the time, we cannot accomplish our goals and jobs without others. If we can do it alone, we wouldn’t need coaches, feedback, or organizations. Completing tasks require communication that is often times reciprocal. Many times, reciprocity is affected by our history with family, friends, and the organizations we work in. In most cases, new relationships require trust building that will be influenced by previous experiences. Without a baseline of trust, help will be slow or limited. Stereotyping, unrealistic expectations, and transference of perceptions. … the client calibrates everything the helper does against these expectations and judges the quality of the growing relationship on this basis rather than on the help given. Meeting defensiveness with more pressure. Accepting the problem and over-reacting to the dependence. Resisting taking on the helper role. Stereotyping, a priori expectations, ‘counter-transference,’ and projections. Will the client understand the information, advice, or questions being asked? Will the client have the knowledge and skill necessary to follow the helper’s recommendations? What is the client’s real motivation? What is the client’s contextual situation? How do clients’ experiences shape expectations, stereotypes, and fears? The helper can choose to be an expert who provides information, a doctor who will diagnose the problems and prescribe a solution, or a process consultant who will focus on the relationships and specify what kind of assistance will help. Schein then outlines the conditions for help to be effective. Principle 1: Effective help occurs when both giver and receiver are ready. Principle 2: Effective help occurs when the relationship is perceived to be equitable. Principle 3: Effective help occurs when the helper is in the proper helping role. Principle 4: Everything you say or do determines the future of the relationship. Principle 5: Effective helping starts with pure inquiry. Principle 6: It is the client who owns the problem. Principle 7: You never have all the answers. Helping lays the groundwork for his next book, Humble Inquiry (Principle 5 above), where Schein focuses on questions rather than answers. How do we get the most ideas for possible solutions? Isidor Rabi, Nobel Prize for physics, said one of the reasons he thinks he has been successful was because of his mother. When he came home from school she didn’t ask, ‘what did you learn in school today?’ Instead, his mother asked him, “Izzy, what good questions did you ask in school today?” Dr. Rabi said the focus of his responsibility was on asking questions and to be curious, were the foundation his own learning. Schein, Edgar. (2013). Humble Inquiry. San Francisco: Berrett-Koehler. Most of us do not like conversations or meetings that spend time telling us what we already know. A summary of what we know, “Yes;” every detail, “No.” When others talk on and on about what we know a lot of the time we just zone out or become secretly irritated. On the other hand, when we are asked questions, we respond differently. Questions are more like an invitation to contribute. It is more of a feeling that what is being discussed has not to be finalized, and my contribution might be useful. Not all questions are equivalent. Humble Inquiry is the fine art of drawing someone out, of asking questions to which you do not already know the answer, of building a relationship based on curiosity and interest in the other person. What seems to really help move thinking along is asking the right questions. Schein is very intentional by combining humility with an inquiry. Humility is required for learning. Humility signals ‘I don’t know, but am curious to find out how or what others know.’ How willing are we to genuinely learn from others? Humility is one of the things we look for in Stakeholder Centered Coaching to find good people who want to be better AND are willing to ask for feedback and suggestions. Think about it, if you already know everything, what’s the point of a conversation. Schein relates the story in his book about his daughter coming down to his study to ask a question and he responded by saying she was interrupting his work. His daughter left crying. His wife came down and said his daughter just wanted to know if he wanted a cup of coffee. We can probably relate to this story because we’ve have done similar things – feeling guilty, making assumptions, and not clarifying the issue. The moral of his example is: Asking a question helps clarify what the other person wants. When the choice is between you or me, look for a way to explore us, the relationship itself. When one is too busy with one’s own agenda but wants to display a caring attitude, what often works best is a small change in behavior, not a total revision of the relationship. A small change allows a brief interruption to get more information before making a big decision. The small change should invite joint problem-solving. Small changes now avoid the need for big changes later. Humble Inquiry would have enabled a small change. Control the process, not the content first. Content can follow and is enhanced when the process is right (Helping – refer back to the summary of his first book). Don’t jump in telling answers until you know what the other person really needs to know. Don’t assume that the person with the question has asked the right question. Asking for examples is not only one of the most powerful ways of showing curiosity, interest, and concern, but also—and even more important—it clarifies general statements. Accessing your ignorance, or allowing curiosity to lead you, is often the best guide to what to ask about. There are other examples with sample questions in the book specifically dealing with Diagnostic Inquiry, Confrontational Inquiry, and Process-oriented Inquiry. Much of Schein’s work has great potential in meetings. Knowing that some meetings are not apparently safe to ask questions, most people complain about attending. These sample questions can help mediate a couple of problems with meetings. Many times there is an encouragement to get into action before thinking. Another problem with some meetings is “the culture of TELL.” We meet, the person with positional authority tells what to do, the meeting is over. Most companies that are being successful have safe meetings with the goal of exploring options and creative solutions. What would be the appropriate thing to do? What am I thinking and feeling and wanting? On whom am I dependent? Who is dependent on me? With whom do I need to build a relationship in order to improve communication? Developing Helping relationships is critical and using Humble Inquiry can lead to building trust and generating more effective outcomes. Schein’s third book, Humble Consulting, relates how these tenets are applicable to being a consultant. Consultants, of course, can be external or internal. Schein, Edgar. (2016). Humble Consulting. San Francisco: Berrett-Koehler. Process Consultation emphasizes the need to involve the client in the process of figuring out what is wrong and what can be done about it. This statement in the preface sets the tone of this book. As a consultant, I spent a lot of time telling. To be sure, there are times to be overt and direct. As a starting point, however, using some of the skills and strategies outlined in Helping and Humble Inquiry might produce better results without giving premature advice. As Schein points out, many solutions are not technical ones. He quotes Heifetz as one who says complex problems today need more ‘adaptive solutions.’ The process of finding solutions is a more long-term strategy than the one problem/one solution mindset that can become more of a “Whack-a-Mole” strategy. Being the expert and providing information and/or advice works, but only for simple, bounded problems. That process also fails when the problem is complex, culturally multifaceted, and constantly changing. Additionally, being the expert can set up the client to become dependent on your ideas and reduce their taking on the responsibility of building problem-solving systems. Humble Consulting Requires a New Attitude of Humility, a Commitment to Helping, and Curiosity. Honor the difficulties that the client faces and to focus on him and the situation, not on my own needs to sell myself, my skills, and my insights. I allow myself to become genuinely curious. It is honest, the spontaneous curiosity that best conveys my interest and concern for the client. “Humble Consulting Attitude.” Think of it in terms of the three Cs—commitment, curiosity, and caring. COMMITMENT: YOU HAVE TO BE EMOTIONALLY READY TO WANT TO HELP. Try not to worry about whether this will produce income or not; let your motive be to see if you can solve the client’s problem. CURIOSITY: YOU HAVE TO WANT TO KNOW “WHO IS THIS PERSON?” AND “WHAT IS THE SITUATION?” Be genuinely curious, because that will make you an active, engaged listener from the moment you are in contact with the other person. CARING: YOU HAVE TO GET PERSONAL AS QUICKLY AS POSSIBLE. Focus on the person and what the client-to-be says to you. Clear your mind as much as possible of preconceptions. Another tenet in Stakeholder Centered Coaching is the discipline to follow through. In a good working relationship, I need to be able to predict how much I can count on you to make and keep your commitments and how open and reliable you will be in your communication with me. At one level of consulting the outcome becomes pseudo help. We meet, we talk, we have great discussions. Yes, I have done this. I let myself become seduced by the problem or the organization. This produces little, if any, real or lasting change. They asked the secretary to join the meeting. Schein asked how she developed the agenda. She said she put down the items as the participants would call her. It came down to timing. There was no effort to prioritize the items prior to the meeting or at the beginning of the meeting. If this is a problem, why not prioritize what has to be decided during the time we meet? How many procedures endure because no one asks a question or challenges the process? In this book, Schein addressed several scenarios that are pertinent to many of our organizations. The only principle is that you should remain committed to being helpful. The most dangerous aspect of being the helper is to give premature advice and thereby to undermine your own credibility. The trap for the helper is that the client had considered it, ruled it out for various good reasons, and now wonders why the consultant has come up with such a bad idea. In the end, the goal is to: 1) find out what the client is worried about; 2) what they see as the preferred future: and, 3) what are the immediate and long-term problems really need to be addressed. The combined wisdom of this trilogy by Edgar Schein goes a long way to make a positive difference. Block, Peter. (2001). Flawless Consulting (3rd ed). San Francisco: Jossey-Bass.